My two boys love their collection of award-winning toy automobiles from The Manhattan Toy Company. This auto themed toy series has been one of their favorites since we originally tested it for a MOTORWORKS collection review in 2013. MOTORWORKS from The Manhattan Toy Company is proud to have recently expanded the line with stylish new automobiles, fun accessories and even a car trailer. When I showed the new collection to my nine year old and six year old sons they were immediately abuzz with excitement. 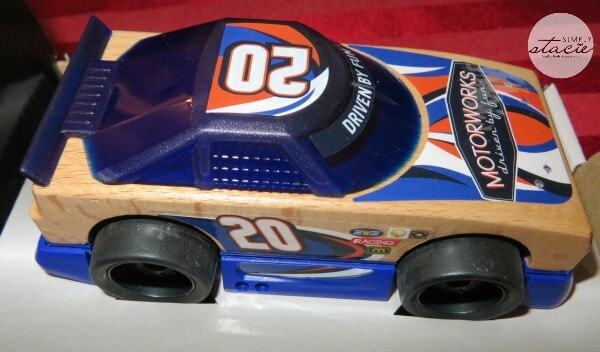 What makes MOTORWORKS such a creative toy line for my boys is that they can actually customize the wooden vehicles. Made of European beech wood which is extremely durable, all of their MOTORWORKS vehicles still look like new even after hours and hours of play….very impressive! My boys could not wait to play together (they didn’t even fight) with their MOTORWORKS vehicles and the new Fuel-N-Shine Station™ and the NGX NextGen Stock 3.0 from the Speed Series! The MOTORWORKS Fuel-N-Shine Station (SRP $40) is a wonderful addition to the collection because it really expands their imaginative play experience. 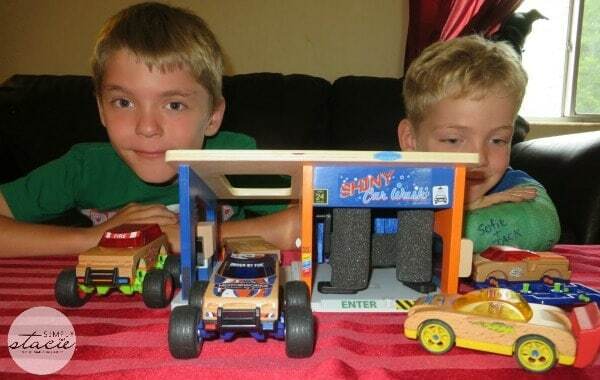 With this wooden play set they can take their cars to a gas station and car wash. Let the creativity soar as Adam and Jacob line up the cars to gas up at the pump and then head over to the car washing area to buff and shine. They love that the rollers actually spin as they push their car through it and had a blast customizing their play set with the 20 repositionable decals. The quality of the materials used to make the Fuel-N-Shine Station is exceptional and I expect it will last just as long as the MOTORWORKS vehicles. In fact, it has been so much fun for my boys (and even my young daughter occasionally) and is such a classic that I will eventually pack their collection away when they are older and save it for my future grandchildren. Getting ready for speed, they also love the NGX NextGen Stock3.0™ race car (SRP $17) from the MOTORWORKS Speed Series that can be built and customized for tons of possibilities….the sky is the limit with this series. This super stylish model has snap-fit accessories which can easily be put into place by the child and features a beech wood frame, wheels, chassis, tire with removable rims, front air dam, rear spoiler and side effects. The pieces are all compatible and interchangeable with all of the other MOTORWORKS vehicles which is what makes this set so popular and exciting for my children. I love to see what they will create during a building session and occasionally find my husband joining in on the fun and bonding with our boys which is priceless. You are invited to visit The Manhattan Toy Company to purchase these two toys and check out all of the other fun new additions to the MOTORWORKS collection! This is the perfect toy line for summer play time and is sure to keep the kids busy for hours at a time. My boys would also have a blast with the Motorworks Play Table. I love that these Motorworks are made of wood and you have so many to pick from I especially love the Motorworks EXX Atomic Rider 2.0 car ant that you can customize them as you like and even get remote control on some of them, neat. I learned that the Tree Top Adventure toy was voted Best of the Toy Fair. I like that these toys are made out of wood. This will make them very sturdy toys that last a long time. I like the Savana Activity Elephant. I like the Dr. Seuss HORTON Blankie. I like all of their motorworks vehicles. They have trucks, cars, and fancy cars too. Great site for boys for sure!! I love the dino book. I love the tree top adventure!!! I really like the Whoozit Starz Lights & Sounds baby toy. I like the tree top adventures toys so cute………. I like the Chopper Chums Hand Puppet Shawn Shark. I like the Chopper Chums Hand Puppet Ty T-Rex for my nephew, but I know he’d absolutely love the Motorworks Station too. I like Flora the Poodle. How cute.